You know the old saying, “When life gives you lemons, make lemonade?” Well, when life gives you unripe grapes, make verjus. Sometimes I am not around in autumn to harvest the grapes in my yard. Sometimes I want a finer crop for wine, so I thin the fruit from my little vineyard of 11 plants. Lest you think I could just gorge myself on grapes if I didn’t want to make wine, keep in mind that wine grapes are small, with lots of seeds — so they’re not the best for eating off the vine. What’s more, I hate the idea of wasting, so I make verjus. Verjus, pronounced vehr-ZHOO, is a sort of vinegar made from the juice of unripe grapes. 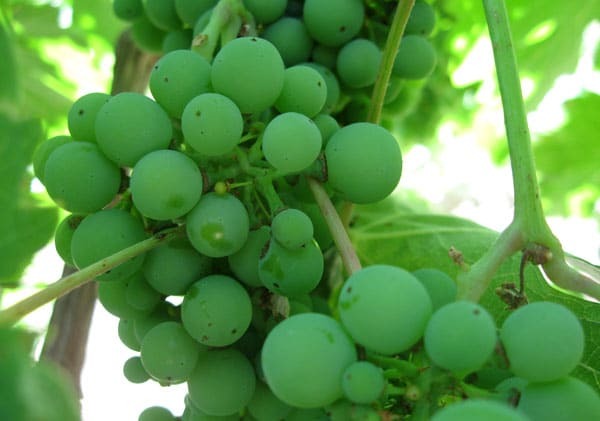 (It can also be spelled “verjuice”) The grapes you see in the picture are not green grapes, they are Zinfandel grapes, which will turn a lovely burgundy in a month or so. 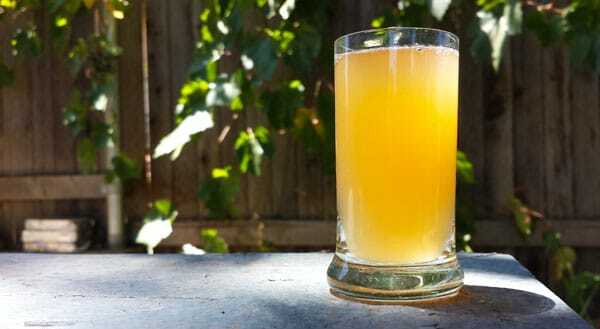 You can make verjus with any unripe grapes, even wild ones. You want to pick them the moment a few start to turn color. As you may have surmised by the name, verjus is a French creation. Traditionally it is made with the thinnings of a vineyard’s crop — the French thin their crop dramatically for reasons having to do with both the quality of the wine and because grapes can struggle to ripen in their comparatively cold climate. Many good California vineyards drop fruit in July to make the vines focus their energy on the remaining clusters. This makes better wine down the road. So how do you make verjus? You will need unripe grapes. Lots of them. Anything you do with grapes requires many pounds for what seems like a small amount of juice. In winemaking, the ratio is typically 12 pounds of grapes to 1 gallon of wine. My verjus ratio was more like 12 pounds of grapes for about 2 to 3 quarts of verjus. So yeah, you need a bucket of grapes to make this. You will need lots of grapes, a meat grinder or food mill, a fine mesh strainer, paper towels, a ladle, some Mason jars and some patience. And, if you want your verjus to hold up for a long time in the fridge, you will need a little citric acid. If you really want it to hold up for 6 months or more, add the winemaker's friend: sodium metabisulfite, which is available at any winemaking shop. This is the "sulfites" you see on wine labels. If you are sensitive to them, skip it. Take most of the stems off the grapes. This will take some time, maybe an hour or so. Longer if you've never done it before. But if you don't do this part, you will have a tough time running the grapes through the food mill. Grind the grapes through a coarse die on your meat grinder. Sadly, the Kitchenaid attachment isn't strong enough for this task, so you need a real grinder. I use a 7 mm die -- large enough to let the seeds get through (you don't want to crush them) and small enough to grind even small grapes. If you have the meat grinder, this process takes only a couple minutes. If you don't, you can use a food mill fitted with a coarse plate. This is a distant second and will require a little elbow grease. As you get a slurry of ground-up grapes and grape juice, pour it into a bowl as you work. You will need to work quickly, as the grape juice will oxidize and turn brown. There is really no getting over this, but the faster you work the greener -- or at least more golden -- your verjus will be. Work slow and it will look like malt vinegar. Now you need to run the ground grapes through a fine mesh sieve. If you have rubber gloves, put them on. Why? The acid in these grapes made my hands sting for a couple hours after I squeezed the ground-up grapes over the sieve. And yes, you need to squeeze your grapes because you really want as much liquid as you can extract. You can take an optional step of straining the juice a second time through the strainer with a paper towel set inside. This will remove a lot of the extremely fine particulate matter floating in your verjus. As you pour, it will catch in the paper towel, eventually stopping the flow of the verjus. You will need to replace the paper towels a couple times. 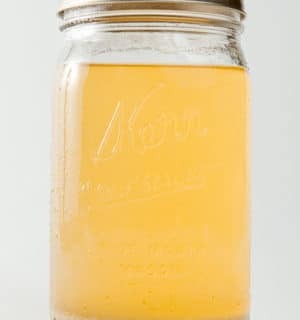 Finally, you will need to pour the strained juice into a Mason jar. It's at this point that you add the citric acid and sodium metabisulfite, if you are using them. Shake the jar well to mix everything in, then put it in the refrigerator for up to 2 days. There will be a very fine layer of sediment on the bottom, even if you did the paper towel trick. You will not be able to strain this off -- it is too fine. So, what you need to do is gently decant it into a clean container. You will lose some verjus, but that's OK. If you don't do this step your verjus will oxidize even more. Nothing bad will happen, but it will look ugly. Bottle and store in the fridge. It should last for several months in the refrigerator, and up to 9 months if you use the citric acid and sodium metabisulfite. You can also freeze it. How to use your verjus? It is an awesome salad dressing -- I've dressed a green salad with verjus and melted wild duck fat many times -- and it is a great thing to use wherever you want a gentle acidity. This is one of my favorite things to make with verjus. 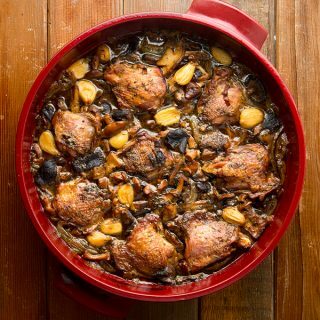 Great with chicken thighs, too. In winemaking, sodium metabisulphite is used to sterilise the bottles, potassium metabisulphite is used to sterilise the wine. Hank- if you have a cider/wine press, could you just use that? How can you make the Verjus shelf stable? Rachel: You can’t. It needs to stay cool.